This has become my new Valentine's Day tradition. Cream cheese and oreos covered in 2 kinds of chocolate, what more could a girl want? Make this easy dessert to share with your girlfriends as you hate on Valentine's day and being single, or make them to win over the man in your life (they say the stomach is the way to a man's heart). A friend recommends making them with white chocolate instead of dark for a winter party so they look like little snowballs. 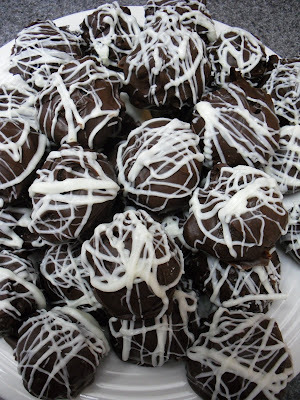 Either way, enjoy this recipe adapted from Kraft's Easy Oreo Truffles. 1. Crush oreo cookies. An easy way to do this is pouring them in plastic resealable bag and take a rolling pin across til they are coarsely crushed. 3. Take out a baking sheet and line it with wax paper. Roll oreo/cream cheese mixture into 1 inch balls (should make about 48). 4. Melt semi-sweet chocolate chips according to package (if this is your first time melting chocolate, be very careful not to overheat or you will have a mass of stiff chocolate that will not coat anything). 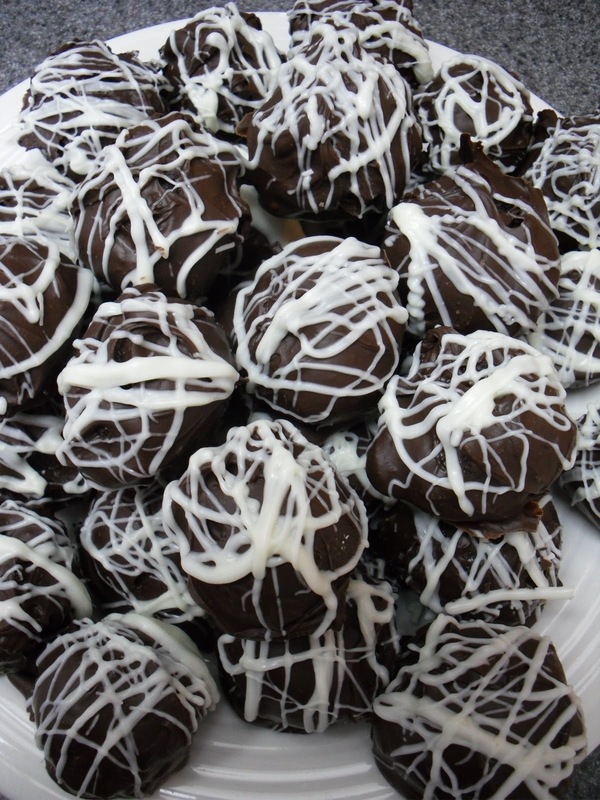 Dip each ball into melted chocolate and roll around to coat, then place on wax paper. 5. After coating each ball with semi-sweet chocolate, melt white chocolate according to package (be careful - white chocolate requires less heat and heating time to melt than dark chocolate!). Dip fork in white chocolate and drizzle back and forth across truffles. 6. Refrigerate truffles for 1 hour before enjoying.